The role statistical methods play in medicine in the interpretation of empirical data is well recognized by researchers. With modern computing facilities and software packages there is little need for familiarity with the computational details of statistical calculations. However, for the researcher to understand whether these calculations are valid and appropriate it is necessary that the user is aware of the rudiments of the statistical methodology. Also, it needs to be emphasized that no amount of advanced analysis can be a substitute for a properly planned and executed study. An attempt is made in this communication to discuss some of the theoretical issues that are important for the valid analysis and interpretation of precious date that are gathered. The article summarises some of the basic statistical concepts followed by illustrations from live data generated from various research projects from the department of Neurology of this Institute. Personal experience of systemic effects of late night sleep deprivation and non-restorative sleep-a common experience amongst doctors, has been described. Results of some simple self-experimentations have been mentioned to highlight the possible pathogenetic mechanisms. Hypertensive encephalopathy is an acute neurological emergency comprising of headache, seizures, visual disturbances and altered sensorium associated with elevated systemic blood pressure. We report a patient who suffered from two episodes of hypertensive encephalopathy secondary to primary renal disease, with the unusual MRI features involving the cerebellar lobes secondary to hypertensive encephalopathy and subsequent resolution. Modified clinical method for eliciting Tine's sign in Carpal Tunnel Syndrome (CTS) has been described. This modified method has been found to be more sensitive in eliciting a positive response (93.2%) than the standard technique (22.7%) in established cases of CTS. This modified method may serve as a useful screening procedure. A 22 year old lady presented with severe headache and sudden onset of gross deterioration of vision in both eyes. Cranial CT scan done showed a seller mass. The symptoms regressed with steroids but then she developed certain clinical features, which could not be explained on the basis of seller mass alone. These included signs of meningeal irritation and sudden onset of right hemiparesis with loss of speech. 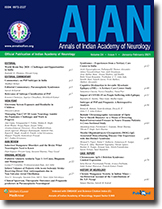 Clinical, biochemical and radiological findings were suggestive of tuberculous meningitis. Hence, the possibility of tuberculoma as the cause of sellar mass was considered. The patient was put on anti-tubercular treatment alone. The seller mass regressed and then completely disappeared after six months of treatment. A one year five month old girl had presented with fever, altered consciousness and seizures of five days duration. Diagnosis of Herpes simplex virus (HSV) encephalitis was made with the results of brain computed tomography (bilateral temporal hypodensities), magnetic resonance imaging showing bitemporal and extensive bilateral occipital hyperintensities and the detection of HSV antigen in the cerebrospinal fluid by indirect immunoflourescence technique. High titres of anti HSV antibodies were detected in the CSF by ELISA. During recovery the child developed cortical blindness which persisted at the end of one year follow up.